Stopped by Get Sum Dim Sum for lunch the other day. It’s so nice to be able to get dim sum in the middle of the day! 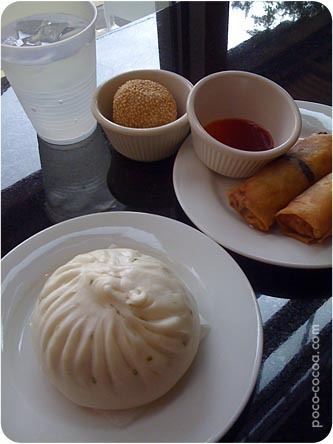 I chose the dim sum lunch special… you choose two dim sum items, a veggie or pork bun, and it comes with a sesame bun. 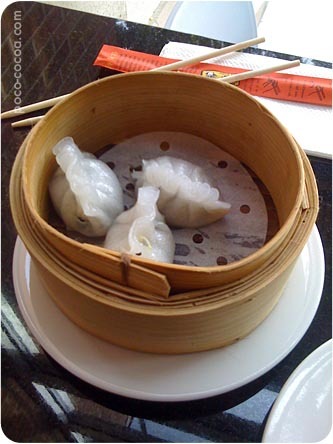 Veggie-mushroom dumplings. Good, but I didn’t care for whatever strongly flavored mushroom was in there. I’ll definitely stop by here again for lunch soon. That’s the place by Central Market on N. Lamar, right? We see it every time we go there and we’ve been meaning to try it. Maybe now we will! I really like that place! I’ve had a few surprisingly good experiences there. Next time you head there, call me – it’s not so far from my house! Nice! I’ve always wanted to try fresh made dim sum, I’ll have to check that place out next time I’m up there.